Pre-Settlement Consulting and Market Analytics to help settling parties make informed decisions. Mandatory Insurer Reporting services for companies of all sizes. Continually developing an inventory of solid cases requires significant resources – how do firms keep up with the demand, and stay focused on the long-term growth of the business? 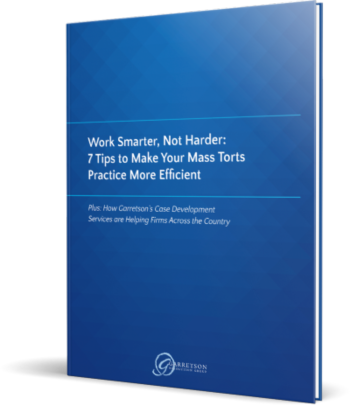 In this eBook, we give 7 tips to help firms drive efficiency. Click to read more. Tell us about your challenges and hear how we can help. Schedule a complimentary consultation today.